EndNote is a desktop citation management product that allows you to collect and organize your references and instantly format your in text citations and bibliographies when writing papers. EndNote is available for purchase at a subsidized rate for University of Arizona affiliates. The most current version of EndNote available for purchase through the University of Arizona is X9. To purchase EndNote, contact the University of Arizona Bookstore Licensing Department at 520-621-2426. If you would like to try EndNote before purchasing it, consider the free 30 day trial (Mac or PC). 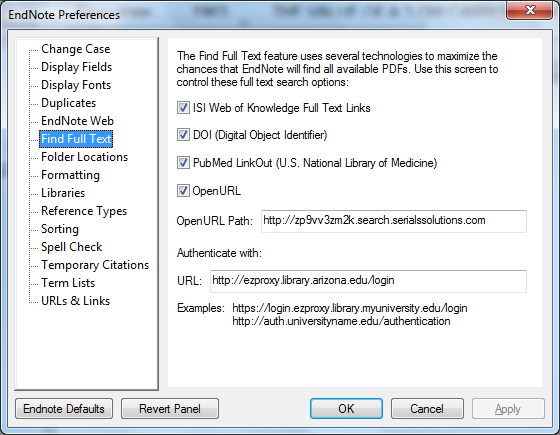 Setting up your EndNote "Find Full Text" preferences will allow you to find University of Arizona Libraries' full text of articles using EndNote's "Find Full Text" feature. Make sure the top 4 checkboxes are checked.